“It’s too hard to do.” – Having to separate paper from plastic, glass and metal requires too much effort. “Recycling doesn’t actually make any difference.” – I never see the benefits of recycling so why bother? “I don’t have the space for all these separate containers”. My flat is small enough as it is, I don’t need more stuff. 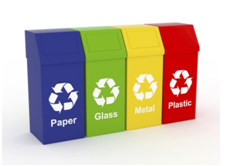 If you don’t have enough space for the separate recycling containers, then choose the one material you use most i.e. plastic and use the recycling container to your heart’s content. You shouldn’t feel guilty for not being able to recycle everything, but one thing is a start. You do see the benefits of recycling every single day. Remember those trees you pass on the way to work? Those are still standing because we recycle paper. Recycling paper means fewer trees are cut down. Do you ever spot wildlife roaming around - Perhaps a grey squirrel or badger? They like trees too. By recycling, we are not destroying habitats for animals. What about landfills? Do you know where your nearest landfill is? A landfill site is an area of land that is used to dump rubbish, either directly on the ground, or filling an unwanted hole in the ground. These sites dispose of rubbish that cannot be reused or recycled. In these landfills you can find household and commerce rubbish. Household rubbish is mostly organic, for example food, paper and cardboard. Organic waste produces bacteria which breaks the rubbish down. The decaying rubbish produces acidic chemicals which combine with liquids in the waste to form leachate and landfill gas. Leachate can become toxic. Recycling reduces the need for landfills and nobody wants to live next to one of those! IT recycling is also important. Dumping equipment in the rubbish can also lead to toxic fumes. We collect all sorts: from computer base units, printers, and mobile phones, to TVs and laptops. Just visit our website and give us a call.